Now that the Gentry project has wrapped up (the new homeowners moved in this week! ), we are ramping up to start a couple of new and exciting projects including another investment property and some renovation work at my own house! Yay! I can’t wait to take you along for the ride! Kohler Whitehaven Apron Sink shown here in the Gentry project. 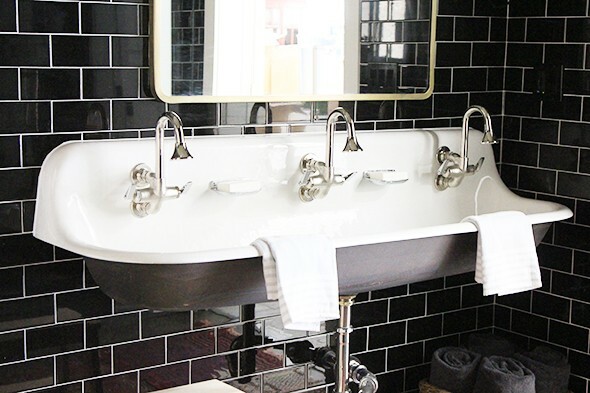 I’ll be using this same sink in my upcoming kitchen reno! Kohler is an amazing resource for me in all of my projects and I always look to their offerings for quality, timeless and modern kitchen and bath products. 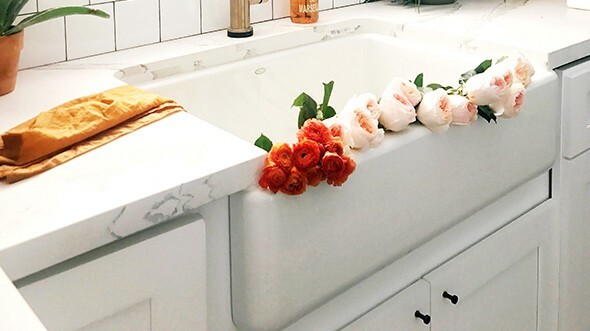 They asked me if I’d be willing to share my take on kitchen and bath trends and OF COURSE I jumped at the chance to get to put together a little preview for you guys of some of the rooms we’ve been dreaming up for our upcoming projects! I think it’s always a good idea to use classic neutrals as your design foundation in any space, but especially in kitchens and baths, and that accessories and lower investment items are great for experimenting with trends. That said, I think there’s a trendy way to do the classics! I’ve rounded up pieces for updated versions of a white kitchen and a black bathroom that I think feel fresh, on trend and completely livable. 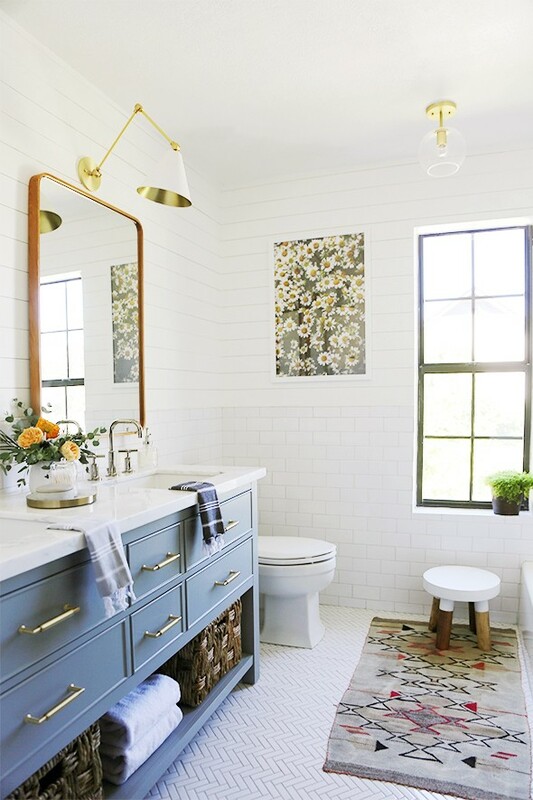 In my girls bathroom reno, I used different shade of white tiles, shiplap and stone to help this room feel layered and more warm. 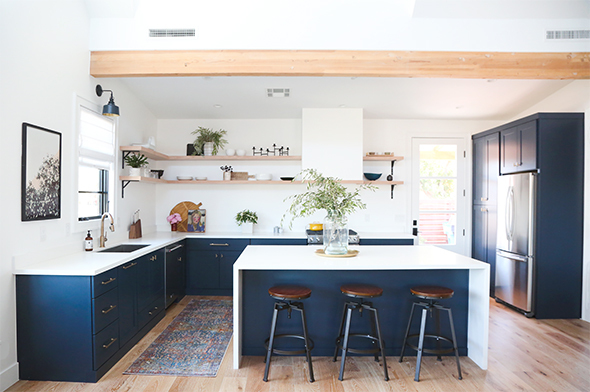 WHERE TO USE THIS TREND: spaces that get great natural light that you want to feel cheerful, clean and energizing. I like white spaces especially in rooms where I want to be able to see well for specific tasks, like getting ready in my bathroom (where I need all the light I can get!! 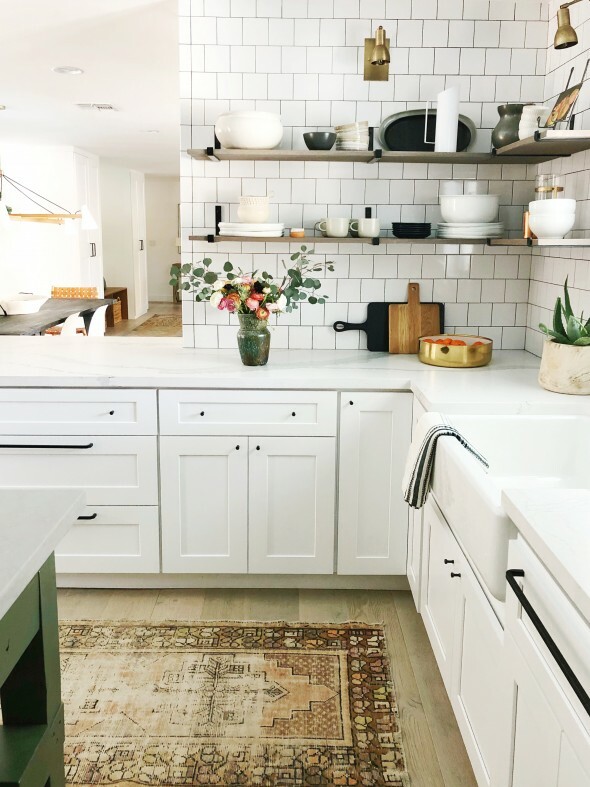 :)) I also like white for kitchens, but lately especially, I love the idea of mixing shades of white ranging from my favorite Benjamin Moore Chantilly Lace to a warmer Swiss Coffee, with doses of ivory and a soft, warm clay color! I think the trick to pulling off this updated look is to add accents of metallics and punches of black in the lighting and hardware as well as moments of warmth through adding wood accents. 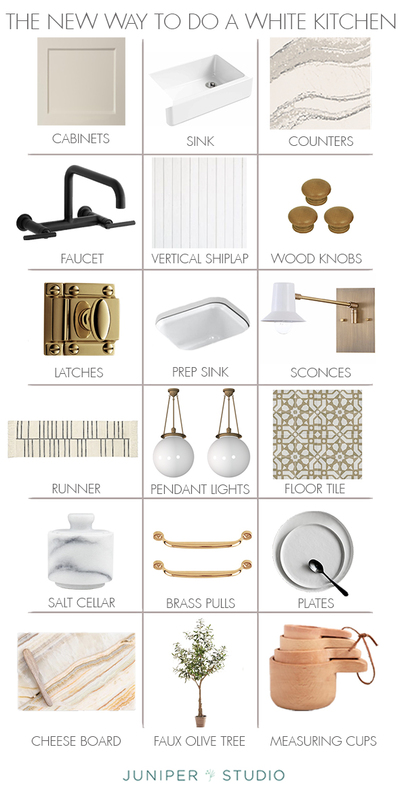 Here’s a kitchen board we’ve been working on that shows my vision for this updated version of a white kitchen! Its a little bit English countryside and a little bit California modern. Isn’t this pretty? 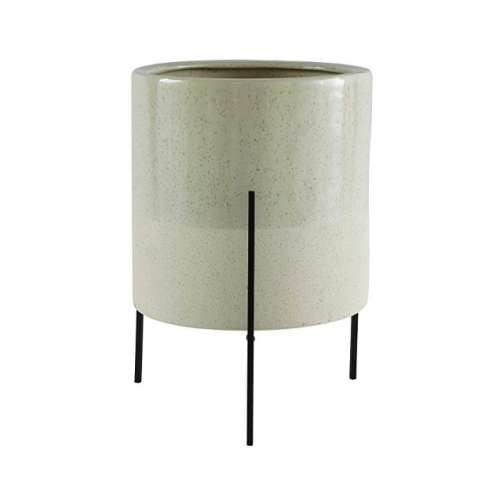 WHERE TO USE THIS TREND: rooms where you want to make a statement and create a dramatic mood. I especially like using dark colors in small rooms that don’t get a lot of natural light, like our client’s bathroom shown above. You might as well embrace the shadows and moodiness! Also I’ve found it can make smaller rooms feel a bit larger. 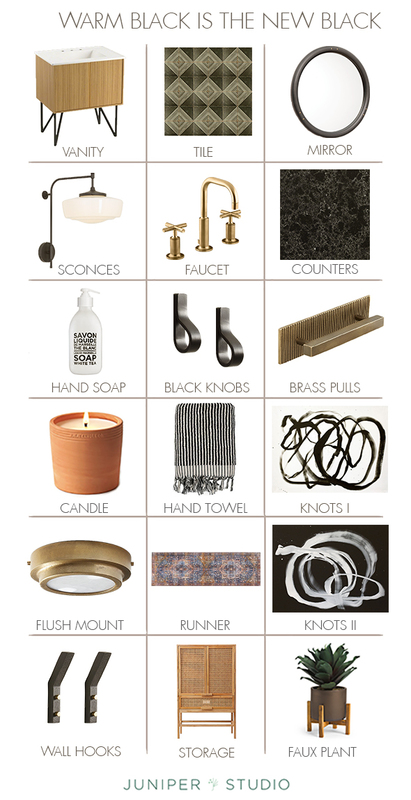 I’m obsessed with warm shades of black and I’m itching to do another dark, moody bathroom in my own house. 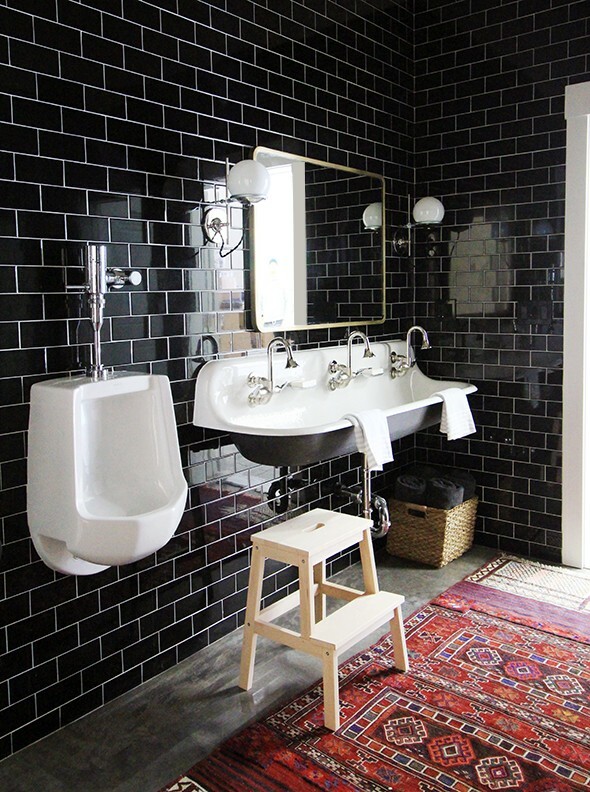 Maybe with this black limestone tile on the walls or just black paint? 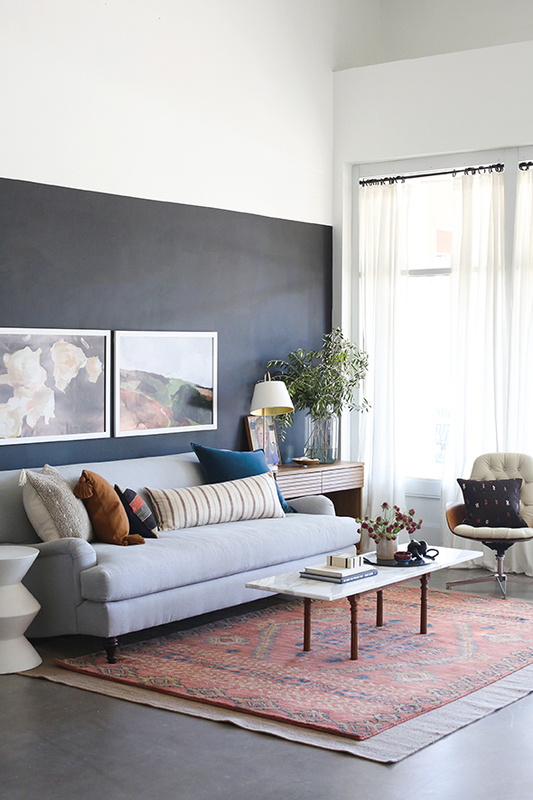 Off Black from Farrow & Ball is a favorite color. 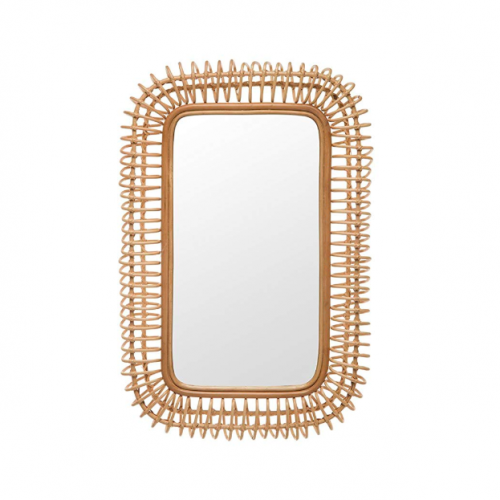 ALSO I’m dying over that Jute vanity from Kohler with those amazing metal legs! WOW! 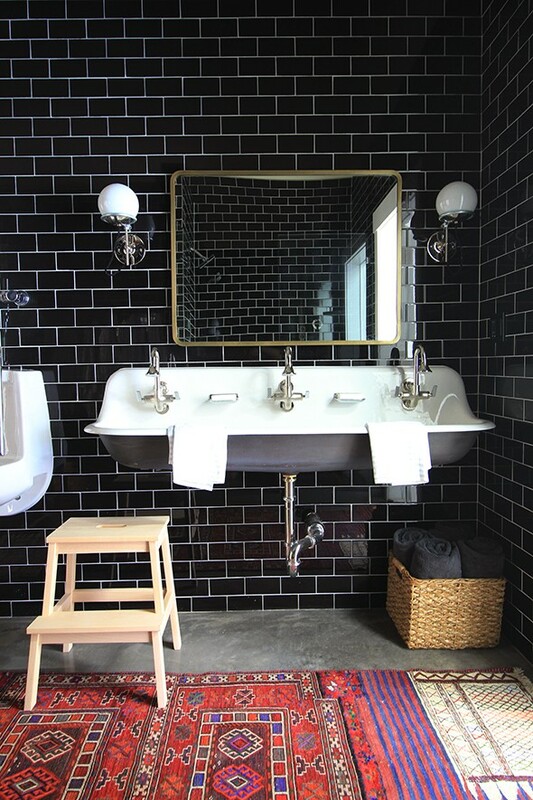 Any sized dose of black in design makes such a chic statement! Thank you to Kohler for sponsoring this post! For more inspiration visit ideas.kohler.com. And thank you for supporting our wonderful sponsors! I love the Antique white color on the semi-handmade cabinets! Do you have any specific paint color recommendations that could match? If you’re looking for a good antique white, try Benjamin Moore Swiss Coffee! My favorite creamy white! I LOVE that kitchen pic!! I have been trying to settle on a cabinet color since we are updating everything and I think this is perfect!! Love the Kohler apron sink too. Will def check out. Ahh this site is so good!!!!! I love the “swiss coffee” kitchen! Lately it feels like everything has gone so modern and minimalist and it just doesn’t appeal to me at all. This english country/california vibe is right up my alley! We just renovated our kitchen with white cabinets and black granite around the perimeter. Our island is a huge slab of statuary marble. 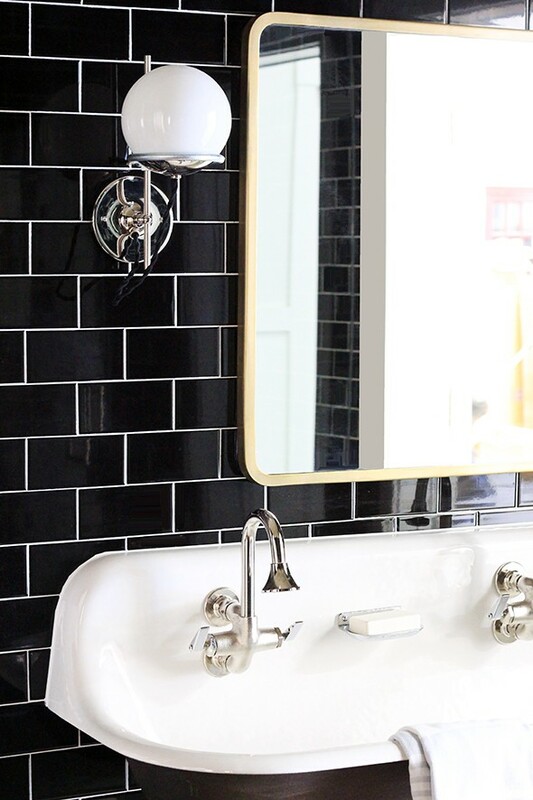 We put in a black LaCornue range with brass accents and used unlaquered brass hardware. I love the white with punches of black and brass to warm it up. Our bar, which is right off the kitchen, is done in all black. Black cabinets with black pearl granite and a large format mirrored porcelain tile all the way to the ceiling. We did a black crocodile wallpaper for more texture. It is so fun to have those different moods right beside each other! I love your girl’s bathroom so much! 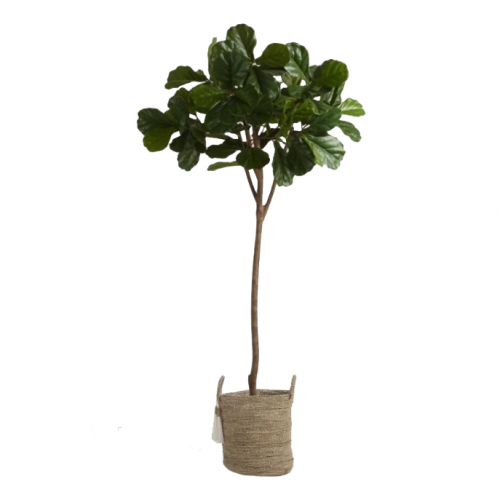 Any suggestions for a wall colour that seems bright and fresh for a room that has very little natural light? I’m not seeing a link for the measuring cups!? And as always love love esp the textured white approach! That warm, taupey kitchen is soooo pretty! I always enjoy the information and ideas you share, thank you! I love the kitchen board! What appliances do you think would look best with the kitchen board? I love this look and am not convinced I want to keep stainless appliances with my upcoming kitchen renovation. 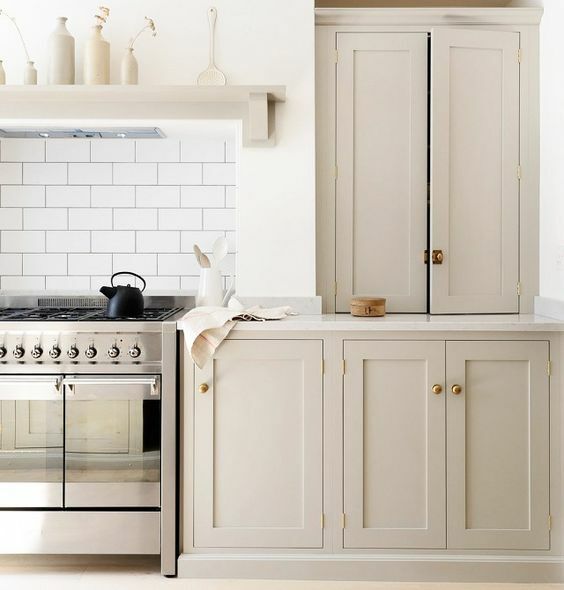 I recently noticed white appliances in a kitchen with white and taupe painted cabinets. The kitchen had mixed wood tones and brushed brass fixtures. The white appliances looked nice and didn’t compete with the beautiful finishes. I would love your opinion on appliance color/finish. Thank you! Very nice inspiration, there is a lot to choose from;) Regards! 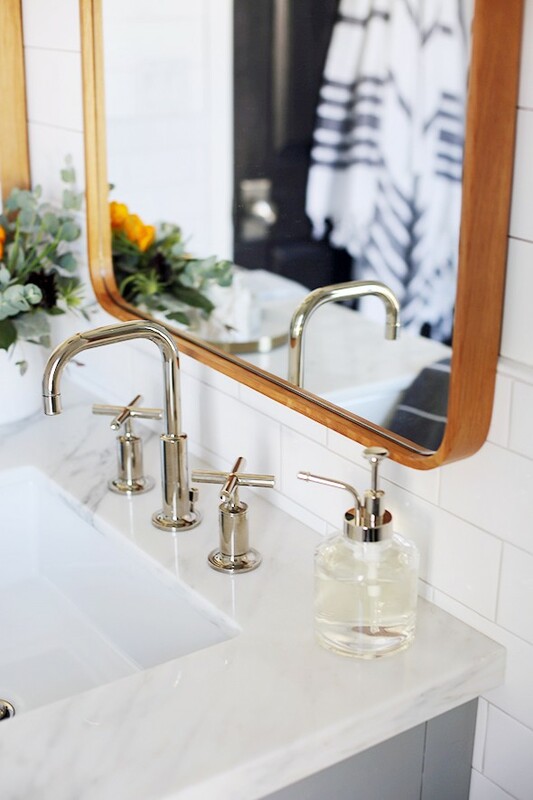 I’m remodeling my daughter’s bathroom at the moment, and have been worried about mixing polished nickel faucets with other brass hardware… Now that I’ve seen your girls bathroom, I’m sold. It looks great! I am very excited to hear about the next investment property you will be working on. Can you reveal what part of the valley it will be in? We are currently house hunting and I would love to know if your project will be in our search range. Love your feed and have been following for years. This post is timely because getting ready to start kitchen Reno. 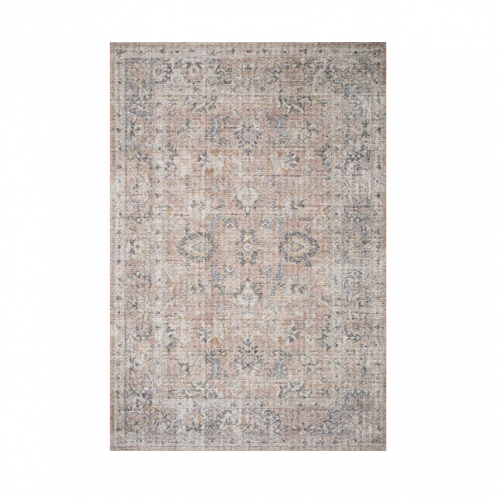 Any chance you could suggest a different flooring that is less expensive. Although gorgeous, $24/square foot is out of my price range.